Cult comedy fans unite, because Frank is coming to a cinema near you! Loosely based on the life of Chris Sievey (and his 80's comic creation Frank Sidebottom), Frank is a quirky comedy about the struggles of aspiring musician Jon (Domhnall Gleeson) as he leaves home and joins an unconventional band headed by the mysterious Frank. 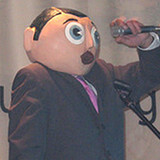 Frank (Michael Fassbender) is as famous for his legendary musical talent as he is for his tendency to wear a large papier-mache head. As head of the band The Soronprfbs, he inspires their unique, off-beat music. Frank details the band's move to Ireland as they record an album while preparing to attend the South by Southwest Festival in Texas. Amidst a setting of hostile housemates, poor performances and lingering loneliness, music is made. As Jon struggles to deal with his bandmates including controlling Clara and stand-offish Baraque, he documents their rehearsals on YouTube and Twitter, which later lead him to a journey to discover who Frank really is, and why he needs the mask. Frank is an interesting look at life as a celebrated musician, and how creativity takes many forms. Premiering in Australia on the 7th June at the Sydney Film Festival, Frank is a film that would appeal to lovers of art and the bohemian. Subtly funny, it's a must-see for any aspiring musician.